AutoRun Architect - Download your free Trial Version! 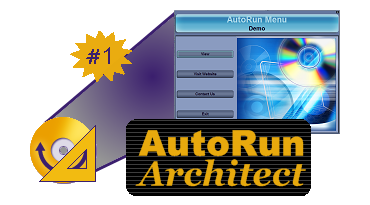 Try AutoRun Architect for free with no obligation to buy! If you're looking for the most popular AutoRun utility for Windows, then you've come to the right place. AutoRun Architect is a quick and easy way to create powerful and stunning AutoRuns for your CD/DVD projects. Downloading and installing is fast and easy! It just takes minutes to create your first AutoRun! Get AutoRun Architect for Free! After clicking on the "Download Now" button submit your e-mail. Once a month we will be giving away a copy of AutoRun Architect to one of the entrants. To start downloading, you must click the 'Download Now' button above. AutoRuns created with the trial version of AutoRun Architect will only run on the computer that the AutoRun was created on. They will also display a dialog box informing the user that the AutoRun was created with a trial version of the software. Purchase the full version of AutoRun Architect to create AutoRuns that you can distribute!